Leading off today: Junior midfielder Aidan Keenan finished with a goal and an assist in the second half as Commack scored a 2-0 win Thursday over Brentwood, the state's top-ranked boys Class AA soccer team. Unranked Commack (5-0-1) took the lead early in the second half on Keenan's shot off a well-placed cross from Matthew Cozetti following a flurry of action at the other end of the field. "It was definitely a counter-attack," Keenan said. "They had a chance at our end and we got down here and just had to put it in. It definitely changed things, you don't want to play behind against them." Tyler Meotti added to the lead in the 67th minute. Milestone: Fairport boys soccer coach Gianni Bussani won his 300th game as the Red Raiders downed Gates Chili 4-0. His overall mark is 300-107-37 in 22 seasons, including a 5-1 record in the current season. Following up: The Daily Times in Watertown followed up on Wednesday's big story, Slater Bushen scoring 10 goals in a 23-0 boys soccer victory over Sandy Creek/Pulaski. • Lyme coach Scott Radley said it was not a premeditated attempt to help Bushen break the state record for goals in a game. "I had no idea what the scoring record was or any of that," he told the paper. "Nobody knew, I didn't know, Slater didn't know." Radley also reiterated that he took steps during the game to keep scoring opportunities down. With just 15 players on the roster, though, Lyme was going to have seven starters on the field at all times. • Sandy Creek coach Steve Olson, whose lineup includes several young and inexperienced players, said he'd heard from numerous fellow soccer coaches but the bottom line is he wants to move on from the issue. "I don't want to take anything away from (Lyme's) hard work or anything like that," Olson said. "Was it disappointing to have a team beat us like that? Yes. I don't think we were playing apples to apples. We are very young, (though) I'm not taking anything away from (Bushen's) skill, by any stretch." One more note: As we noted yesterday, the previous state record for goals in a boys soccer game belonged to Dennis Miles in a 1968 game for Friendship in Section 5. Gatehouse Media regional reporter John Anderson pointed out that Miles is the same Denny Miles who's coached baseball at Wellsville for four decades and is on pace to break Eddie Nietopski's Section 5 record for wins in that sport next spring. 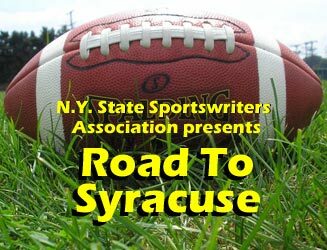 •Congratulations are in order for Anderson, who's assisted the New York State Sportswriters Association over the years. He's moving north and will assume duties as managing editor of The Daily News in Batavia on Sept. 25. More soccer: Broad- albin-Perth's 1-0 boys soccer win over Johns- town on Wednesday was the 30th career shutout for goalkeeper Ian Halloran, who made three saves. B-P was a man down for most of the second half and each tram missed a penalty kick. Coming up: There are 140 schools entered in Saturday's Wayne Eagles Invitational, being contested on the Section 5 course that will play host to the NYSPHSAA cross country champion- ships in November. Small-school varsity races begin at 10:30 a.m. The Division II races start at 1:30 p.m. and Division I at 3:30 p.m. The opportunity to run at the state-meet course always attracts talented fields, and this is no exception. The top three teams in Class A -- Fayetteville-Manlius, Corning and Niskayuna -- head the Division I boys field. At least five of the top eight squads from classes B and D will run in Divisions II and IV, respectively. The girls fields are similarly packed, with No. 1 F-M, No. 3 Niskayuna, No. 4 Saratoga, Nov. 6 Liverpool and No. 7 Monroe-Woodbury from Class A heading the Division I field. You can view the list of competing teams here. Extra points: Mike Zacchio at The Journal News tweeted this week that Tom Cromer has resigned as girls basketball coach at Tappan Zee. More soon: I'm writing up some football material in a separate blog for later Friday as we get ready for Week 3 action.